According to John Batki, the translater of Erno Szep's Holocaust memoir, The Smell of Humans, the phrase "I used to be Erno Szep" is how Szep introduced himself after World War II. Szep (1884-1953), also according to Batki, is an author "in danger of falling into a 'black hole' of the nation's collective consciousness." He certainly exists in a black hole outside of Hungary; except for The Smell of Humans, none of his work appears to have been translated into English. During his life, Szep was known as a poet and playwright, and according to information on the internet, some of his plays are still performed in Hungary. His scant biography is, however, immaterial, as he suggests in "The Autobiographical Statement (1947)" that precedes his memoir: "One's life history shows in one's thinking. What took place in my head constitutes my life; the other things that happened to me were not really my doing and do not belong to me." The Smell of Humans was first published in Hungary in 1945 as Emberszag. In 1984, it was reprinted in Hungarian, and in 1994 was translated and published by Corvina Books and the Central European University Press. The back cover of the English edition describes it as "primarily a piece of creative writing and autobiographical literature," This, in my view, begs the questions--as all autobiographical literature involves creative construction of a self and its history, and all creative writing somehow bears the life history of the writer. The cover goes on to describe the book's tone as a "meld of stupefaction and irony," and this strikes me as completely right. The book describes events between October and November 1944, after the brunt of the "organized" part of the Holocaust in Hungary had largely transpired: the deportations and transports to Auschwitz. During this period, Szep occupied one of the Jewish Yelllow Star houses but had been saved from deportation, in part, by being protected by Raoul Wallenberg. Nevertheless, on October 20, 1944, the 60-year old Szep, along with about fifty other elderly Jewish men, was rounded up and sent on a forced "labor" march by Arrow Cross thugs. The Smell of Humans narrates the 19 days of the march that Szep experienced. Despite the full horrors of Hungary under the Nazis, most of the men who are taken with Szep on this march are flummoxed at what is happening. They appear, dressed in gentlemanly clothes, carrying suitcases and knapsacks with food and utensils. They all smoke, and have brought various forms of tobacco. The men over 60 assume that this is all mistake and they will be returned to their home soon. Things, however, go from bad to worse, and realization dawns (at various speeds) about the brutality of the Arrow Cross youths and the complete meaninglessness of the work they are forced to do. Szep's description of what is happening similarly becomes more and more anchored in the brutal details of the men's torture. His tone, however, continues to reflect both the stupefaction of the elderly men and the irony Szep locates in their predicament: the quotidian realities of old men sleeping, defacating, smoking, snoring together. 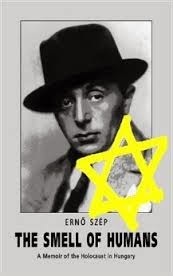 When Szep was first taken into the ghetto and forced to wear the yellow star, he says "I thought I would die, degraded to the level of a marked beast, a marked object. No, they wouldn't see me wearing that star." Szep never denies he is Jewish, nor is he anything but loyal and supportive of the men with whom he marched. But being Jewish is not a part of his identity in the way being Hungarian is. It is this sense of being "other" that seems to me the source of Szep's deepest existential irony. The Hungarian title of the book, Emberszag. joins the Hungarian word ember--or man--and swag--or odor. It is, I discovered, the concluding word of the saying "Fee, Fie, Foe, Fum, I smell the blood of a. . . " in Hungarian. In this saying, the monster smells the man whose odor identifies him as something "other" than the monster. But even though many claim that people of a different race, ethnicity, religion, "smell differently," the truth is that they all smell like humans. In this case, the monster is the "inhuman" Arrow Cross youth who smells the human, Jewish man. Near the end of the The Smell of Humans, Szep says that "A man's biography consists of his thoughts. Everything else that happens to me is something alien." This assertion of the self in the face of meaningless brutality may be what allowed Szep to write this remarkable book. My book group often reads Holocaust related novels. As emotionally difficult as almost all of them are, we seem to circle back to them again and again - I think that we still just can't bring ourselves to believe what people are capable of doing.